I’ve started a dresser project, and I’d like to make a small hutch for the top similar to the one in this image. Does anyone have any ideas on where I could purchase something that has a similar profile to the board that makes up the drawer face? Or how one could go about making this profile? I have a router table, but do not have a shaper, which is how I’m guessing this is done at the factory. Thanks for any thought you have! Look into cutting coves on a table saw. That should get you pretty close to this type of profile. Yep, ditto to Quikenuff. Don’t think you can buy that, but it’s not too hard to make on the table saw. Scroll down and you see the fence that I set up on the table saw to cut the cove. Effective jig there PPK, good job! Thanks everyone! That should be perfect. Until I looked this up, I’d never seen a table saw used for this before, and I look forward to giving it a shot! I’m thinking like these guys, use the table saw. 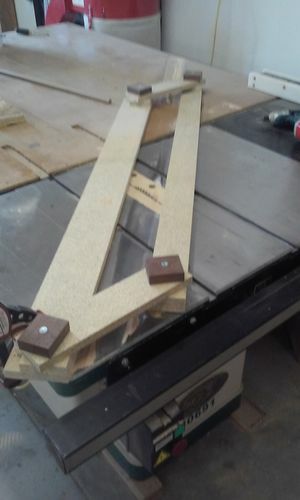 Use the saw to make a cove in a piece that’s 1 1/2×6, then rip it in half and have two matching pieces.